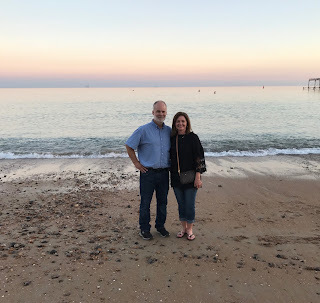 Our first night in Brighton. 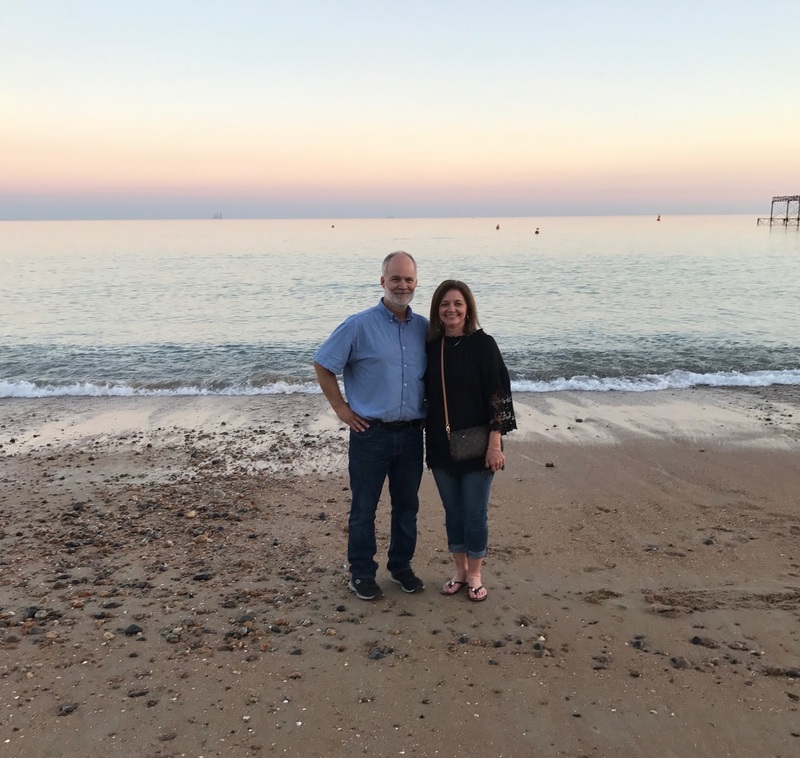 The English Channel behind us- water was very cold!! It is very hard to believe that Dr T and I are celebrating our second anniversary! Our lives have changed so much over the past few years. Knowing that we are starting our third year being married is an indescribable feeling!! He and our relationship grow more special and more important to me as the days and weeks go by. He is so good to me, and we just seem to "get" each other. Maybe it's the grief thing that we have in common. Maybe it's the deep friendship that started with that 15/16-year-old girl and that 17/18-year-old boy who were such special friends in high school. I like to believe that it is those things plus a huge "God Thing." I truly believe that God placed a special place in each other's hearts for our friendship. He made sure that we got to know each other and have a special bond because he knew how desperately we would need each other later on in our lives. As a great friend once told me, "God moves the puzzle pieces of our lives." That surely seems to be the case for us!! As I sit here in a hotel room in Brighton, England, writing and thinking about my life today, I am so thankful for what has been, grateful for what is, and hopeful for what is to come. I look back over the past 2+ years and I see the miracle that has been my life. I see stresses and strains. I see joy. I see pain. AND- I see growth. It hasn't always been easy these past two years. We have had our struggles. We both brought baggage into this marriage from our pasts that needed to be dealt with. 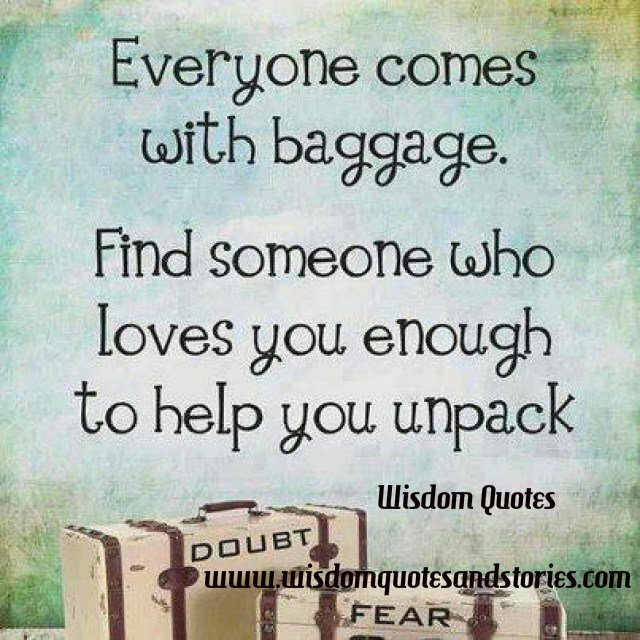 I shared a quote with Dr T one time, "Everyone comes with baggage. Find someone who loves you enough to help you unpack." 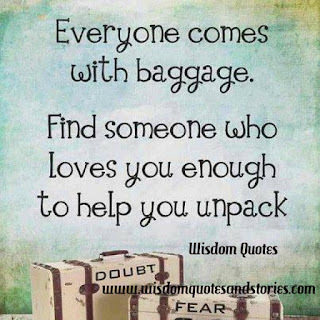 I think that I have helped him unpack his, and I know he has helped me unpack mine. Over the past two years, we have truly tried to live our life together abundantly!! But we have said and done things to hurt each other as well. We have had to join two completely different lives, and that is not an easy task. One thing I know for sure is that although it hasn't been easy, it certainly has been worth it. It is interesting being in this life together-- being each other's Chapter Two!! I made a quick dash into a store before we left the US to find an anniversary card so I would be sure to have one while we were here. What I thought would be an in and out quick trip turned out to be over half an hour looking for a card. First, I wanted to try and find one to convey to him how much I love him and appreciate him. But I also wanted it to be real and honest. Dr T and I aren't each others' "one and only." We aren't each others' "only true love." We are each other's support and strength. What we do have is a bond that runs extremely deep. We have an affection for each other that goes way beyond the surface level of a mutual attraction to someone. I have come to realize that my soul is in need of his soul. And I was able to finally find a card that said what I wanted and needed it to say. It speaks of wanting to "savor every moment" and "feel deep gratitude for every single day." That is what our life together is. Old Faithful... the list goes on. Not bad for two years!! Our latest from this trip-- Kissing Selfie in front of Buckingham Palace!! ( I know you probably think "how stupid" but it has been fun to do. And we get a sweet kiss in the process) My kids would be gagging right now if they read my blog!! But I wonder where else we will get to take a "kissing selfie"? A girl can dream, can't she?? We were so hot! 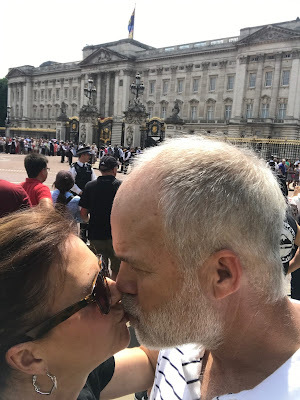 We were living on the fumes of only 2 hours sleep on our flight to London, but it was a very special day-- We were in London for the festivities of the Queen's birthday!! The past two years have flown. I'm looking forward to what the future brings with my adventure partner, soul mate, and best friend!!! What Can I Do When A Friend Loses A Loved One?